“Let’s eat clean (he means plant based when he says this) until Thanksgiving!” Those are the words my husband dared to speak to my pregnancy-fatigued soul, amidst moving boxes and off-schedule toddlers. I looked it up today “how many days until thanksgiving, Google?” 16 days. Basically two weeks. So, I decided to blog about our 2 week plant based challenge. Now, I accepted this challenge because number one- I love my husband! But also, I have gone crazy this pregnancy. Candy, cookies, sweets have been a staple in my diet. Not only has it made me feel crappy and low-energy, but I know it’s not good for little unborn baby Haven. Plant-based makes me feel energetic and great! So, I’m hoping this two week plant based challenge will set me back on course to have a more plant based, nutritious diet. This will also make it easier when I switch back to normal eating after pregnancy cravings have dwindled. I’m just focusing on keeping the diet exactly that – plant BASED, meaning the foundation of every meal is plants. I’m not stressing over keeping it vegan. And I’m not stressing over portions. If I want a whole head of kale, well I’ll just eat until I am satisfied and filled. This is day one. So tired. Moving all weekend was rough. And I’m determined to complete all my Piyo workouts on my 8-week schedule so that means 2 workouts today. I see the schedule taped to the wall. Ugh. But that’s later. Time to get the girls ready for daycare/work. I struggle with Sofia who is about as excited about getting up as her mama. Kate actually slept through the night, and I’m so glad we didn’t have a repeat of the night before where I ended up sleeping with her after two hours of crying/consoling/crying/…. Shew that girl is stubborn! Paul changes her diaper & I put her clothes on. Then Paul & Fia head to the city and Kate and I head to the office. But not before I make a vegan chocolate shakeology shake. I throw a cup of strong coffee into the blender so that maybe that will help. It doesn’t really. I feel like the walking dead for a good hour and a half. Grandpa takes baby Kate with him to the bank, and I use a small reserved energy to accomplish office tasks. On on my way home from lunch around 1 I swing by the store. The checker comments on how healthy my diet is. LOL. If only she knew I had chicken wings, riesens & twizzlersfor dinner last night. When I got home,my mom was walking with Kate to the playground. Guess grandpa & grandmother had switched. It’s sort of nice having all your family so close. (I basically live in a commune now. Lol.) but it’s AMAZING when you’re 31 weeks pregnant & been moving for the last week. I whipped per up this lunch. Eggplant parm patties and lemon tahini kale. The patties are adopted from this recipe, but I threw on a handful of shredded Parmesan before forming it into balls. Also I cook it on the stove as patties rather than oven meatballs.) Then I continuously flatten & flip in the sauté pan because I like it that way! While led that was cooking, I poured this lemon tahini dressing (I use grated Parmesan instead of nutritional yeast; but I’ve had it both ways, and both are good) over a bowl of chopped kale. I mixed it in and then threw all of it in a sauté pan and cook covered, adding water as needed. I take it out when it’s soft but still bright green. the kale is sort of adapted from this recipe. I really want a cookie when I finish lunch. I am terrible when it comes to sweets during pregnancy. I have a handful of frozen grapes instead, and start my Piyo workout. Today I did Strength Intervals and half of Core. The core workout is so great for pregnant ladies. The majority of the moves are in prone/plank or standing. There’s only about 5 minutes of it that I can’t do because it’s on my back. And it provides so much strength work to keep those abdominals tight and strong (good for bouncing back to a somewhat flat tummy postpartum and for PUSHING during labor. Here’s a few other reasons why PiYo is awesome for pregnancy. Seriously love the way this workout makes me feel! We had a salad for dinner with onions, tomato, cheese, carrots, romaine, avocado, and a little too much dressing. At night when I am craving something sweet, I have some shakeology (any chocolate protein mix would probably work) protein brownie mix that I made kind of like these only I never shaped them into brownies, just ate it like batter. I went to bed satisfied and feeling very accomplished that I went 24 hours without a cookie. Hi, my name’s Lauren and it’s been 1 day since my last cookie. 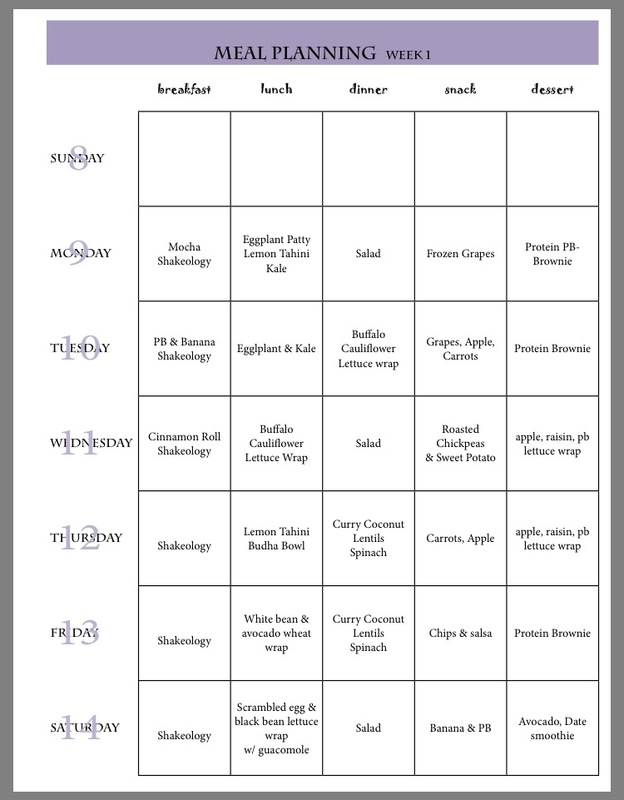 Here is my meal plan for this first week. I may not stick to it exactly, but it gives me a foundation to work with. I find it makes meal planning and “clean eating” easier when I use repeat meals. When the meals are creative, colorful, flavorful, diverse, etc… it doesn’t feel monotonous to me at all. This is awesome! I was not a tedious as you were when I was pregnant but that’s inspiring to see that this meal planning helps you check whether you are meeting your goals! 🙂 Enjoy! I am hoping to do some yoga today!!! GLad you are liking your piyo! I’ve never heard about Piyo until reading this. Sounds like something I should look into a bit more. Congrats on day 1! I really enjoyed Pi-yo. I am determined to get back into it! Good luck on your “diet”! I hate that word haha! But you are doing great being pregnant and trying to exercise and eat right! Good for you. I’ll have to try your kale recipe you posted…we don’t eat it much because I have no clue how to cook it. We only put it in smoothies 🙂 Thanks for sharing! Sounds like quite a commitment while pregnant. I certainly wasn’t that good about what I ate when I was pregnant, but I did keep up the exercise – running around 6-10 miles 4x a week, and core work. 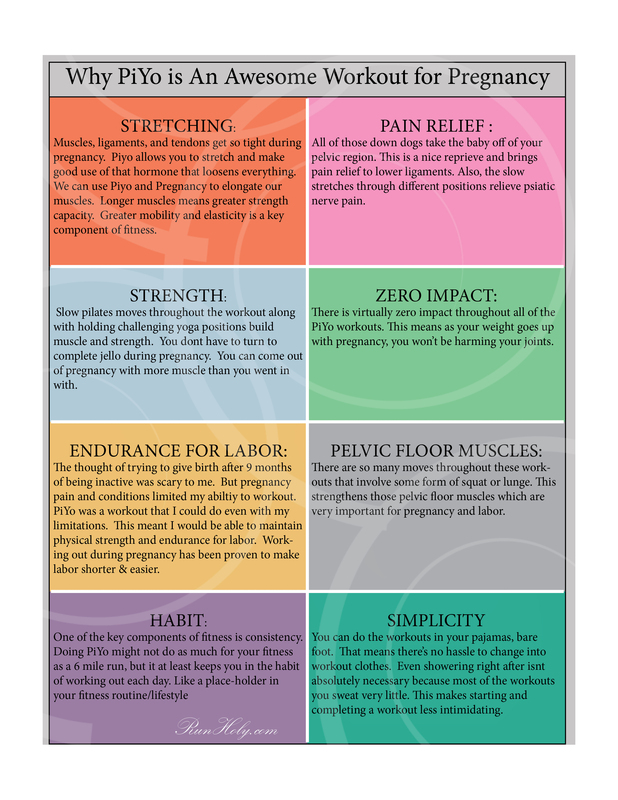 The pelvic floor muscle work was a great help during labor. 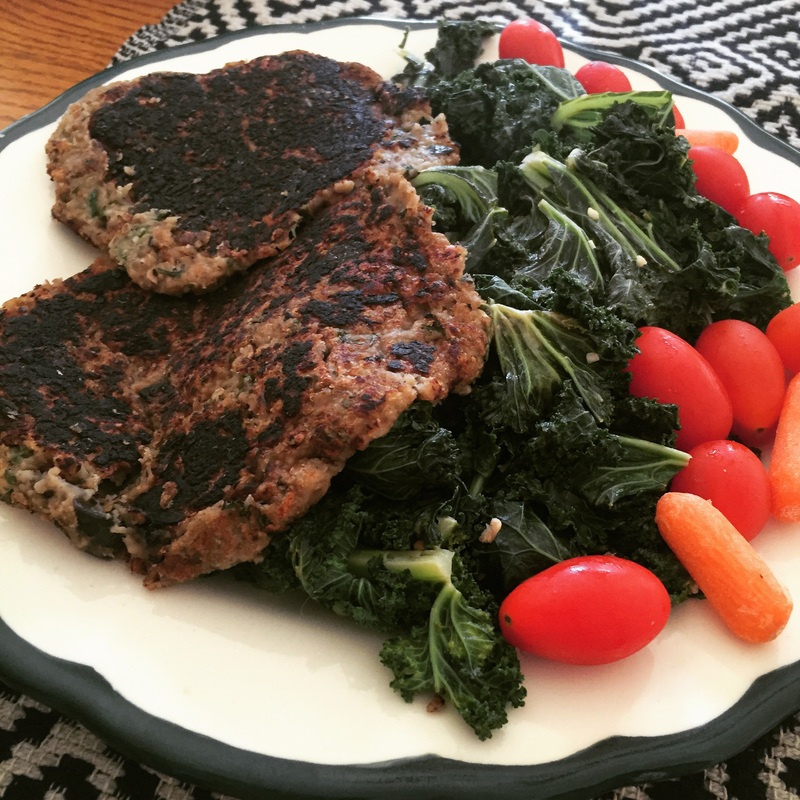 It’s always good to reset like this every now and again – I use Whole 30 to do so! I am doing a #30DaysWithoutComplaint challenge that I thought was hard – until I read this one. You GO, girl! Brave lady! Pregnant and vegan. Wow. I never heard of Piyo either but I ended up with three c-sections. This is a great post! I’m pregnant now and this is a great template to use! Good job on rocking Piyo today! I’ve never done it but I did yoga last night for the first time in weeks… it felt amazing and I went to the gym today for strength training and cardio ( I even ran some). Good luck on plant based for the next two weeks, my husband would never do that with me. Pity sounds really exciting! I’m not sure that I could eat a plant based diet for a couple weeks. I can totally see my wife wanting me to do that with her though. lol! Best wishes to you guys though! I love this idea. Thanks for including the meal plan and taking some of the brain work out of it! I’m not pregnant, but this would be good for anyone!